Ver. 2. Michaia, alias Maacha. Her father had also two names; viz. Absalom or Abessalom, and Uriel. Ch. --- Many had two names. T. --- Of Gabaa, may refer to the women. Ver. 3. War. The author of the new edition of S. Jerom mentions two MSS. and there are several printed editions, which reduce these numbers to one half. Castalio adopts this correction, asserting that the Greek and Josephus are on his side, which is not true. C. --- We must however observe, that there is some doubt with respect to Josephus, (H.) as some of the oldest Latin editions acknowledge the smaller numbers; and Vignoles (i. 29.) conjectures, that the Greek copies did the same formerly, since Aborbanel "accuses Josephus of having made Jeroboam's loss no more than 50,000, contrary to the Hebrew text," v. 17. This learned author is of opinion, that the Jews sometimes expressed their numbers by figures, (Kennic.) analogous to those which the later Arabs borrowed from the Indians; though, in more ancient times, the letters of the alphabet had been used. Both customs seem to have prevailed; (Erpenius) and this may account for many variations, as the omission of a single cypher, resembling our period (. ), might easily occasion much confusion. Kennicott (Diss. i. and ii.) seems to suspect, that the ancient versions have been made to agree with the corrupted Heb. no less than Josephus; and that many of the large numbers, recorded in Scripture, (which might countenance what we here read) are incorrect. See C. xvii. 13. 19. and xiv. 8. comp. with xvi. 1. and xxv. 6. comp. with 4 K. xiii. 7. It is certain (H.) many Latin MSS. confirm the edition of Sixtus V. which has the smaller numbers; and this is the case with most of the older MSS. and editions. How S. Jerom expressed it, we cannot easily determine. The editor of his works has been guided chiefly by the Memmian canon. See 2 K. xv. 7. Lyran quotes S. Jerom, as reading 50,000; (v. 7) and it is so expressed in the Paris editions of 1534 and (H.) 1546, of the Heb. questions on Paral. But Erasmus doubts whether this be the genuine work of S. Jerom, (Ken.) or in the state in which he left it. If we consult the more ancient MSS. and editions, prior to that of Clement VIII. we shall allow that they are more favourable to the smaller numbers, on this occasion; and are more likely to exhibit the pure version of the holy doctor, (H.) as the later editions have had "the Heb. fountains" also in view. Kennicott --- If however we adhere to the received numbers, (H.) we must remember that kings, at that time, led forth to battle all their subjects who were able to bear arms. Under Moses there were 600,000. David found 1,100,000 in Israel, and 470,000 in Juda, exclusive of Levi and Benjamin; (C. xxi. 5.) or, at least, as it is expressed 2 K. xxiv. 9. in all, 1,300,000. Asa was at the head of 580,000. C. xiv. 8. &c.
Ver. 4. Semeron, on which Samaria was afterwards built. Heb. reads, "Mount Tsemaraim." There was a city of this name in Benjamin. C. --- But this was a mount. Heb. "in Mount Ephraim." H.
Ver. 5. A covenant of salt. That is, a firm and perpetual covenant. See Num. xviii. 19. Ch. W. --- It seems this covenant was to be inviolable; and it had its effect, notwithstanding the crimes of many of the kings. The Arabs still regard the partaking of bread and salt as the most sacred covenant. C. --- "The ancients prayed when they placed salt before their guests, that, as salt partook of two natures, so they might be cemented together in concord." Tzetzez on Lycoph. H. --- Abia speaks with much prudence, and with an air of piety, though his heart was corrupt. 3 K. xv. 3. That of his adversary was still more so; and God granted victory to the former, to reward even the appearance of virtue in the king, and the sincere piety of some of his followers. Ver. 7. Vain. The saem term is used as in Matt. v. 22. C. --- Rekim, "stupid men." H. --- Sept. "pestiferous." Syr. "impious." --- Heart. Prot. "young and tender-hearted." H. --- But Roboam was not very young; (3 K. xiv. 21.) and we may adhere to the Vulg. C. --- Sept. "he was a youth, and timid." H. --- Abia speaks of his father with little respect, and seems to have forgotten that he had laid down his arms in obedience to God's order. C.
Ver. 8. And golden. These idols will enervate and render your great numbers useless. H. --- We have a just cause and religion is on our side. C.
Ver. 9. Rams. These were sacrificed by the false priests, who acted in a very different manner from those of the Lord. Lev. viii. and ix. C.
Ver. 11. Table. It is hence inferred, that Sesac had only left one: (Lyran. Torniel.) but this does not follow. C. Salien. Ver. 14. Trumpets, to invoke God's aid. Num. x. 9. M.
Ver. 15. Terrified. Sept. "struck;" God caused the victory to declare in favour of those who were only half the number. H.
Ver. 17. Five. Some Latin editions have 50,000, (C.) which number is found in some MSS. of Epiphanius. Hudson's Josephus. --- Hentenius has the same, and only remarks five MSS. which had the greater number. See v. 3. H. --- We do not read of such a slaughter in any one battle. But Israel made no resistance, and God assisted the four hundred thousand. M. --- Valiant. Prot. "chosen." See C. xiv. 13. H. --- So many were either slain or wounded. D. --- Prot. intimate all were "slain." H.
Ver. 19. Bethel, the head of the calf worship; though Abulensis thinks it was another city, otherwise it would not have been spared. The calf continued there till the reign of Jehu. 4 K. x. 29. M. --- Jesana; perhaps Senna, (Num. xxxiv. 4. C.) seven miles north of Jericho. Eus. --- The versions read differently. --- Ephron. 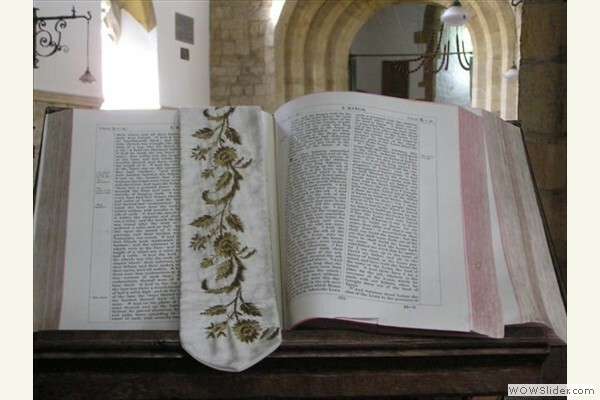 The Masorets have Ephraim. C. --- Prot. "Ephraim, with the towns thereof." H. --- Josue (xv. 9.) places Mount Ephron between Juda and Ephraim; and we find a town of the name, (1 Mac. v. 46.) but on the other side of the Jordan. Ver. 20. Him. Some think Abia, as Jeroboam survived him two years: but others, (C.) with greater probability, (D.) suppose that the latter is here specified, and that he fell a victim to the divine wrath, as the prophet Ahias had foretold. C. --- Salien, A. 3081. Ver. 22. Works. Prot. "sayings are written in the story of the prophets Iddo." H. --- Modross properly means "researches," and was the title of the genealogical work of this prophet, from which this account is probably taken. C. xii. 15. C. --- The entire work is not extant. M.